In this summer heat my bananas are going brown pretty fast... and banana biscotti is a great way to use up really ripe bananas. Turn the oven on to 160degC. Mash the banana with a fork and put in a medium-sized bowl with the egg, vanilla, brown sugar, flour (which has been stirred with a fork and spooned into a cup) and the salt. Fold everything together without overmixing, adding the water if the mixture is thicker than a muffin mix. Line the base and long sides of a medium-sized loaf tin with baking paper and spoon in the mixture, flattening the top with the back of a wet spoon. Bake for 15-20 minutes until a skewer comes out clean. Take from the oven, remove from the tin by loosening with a knife and cool on a rack. The loaf should be a pale colour. Reduce oven to 125 degC. When the loaf is cool, cut it into 7mm slices with a sharp, serrated knife. They don't taste great at this point. Lay them on an oven rack rather than solid tray and bake at the lower temperature for 15-20 minutes until golden brown and crisp right through. You may need to remove one from the oven to check this. 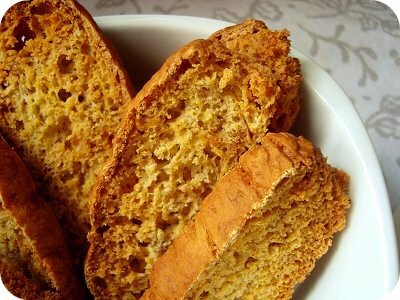 Watch the biscotti don't get too brown otherwise the flavour is spoilt. Store in airtight jars for up to two weeks. 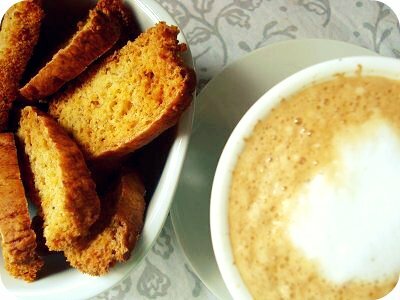 It's about time I make some biscotti. Thank you for your recipe! Yum yum double yum. I have to print that one off for the recipe folder. They look great and I've got a few over rip bananas myself, so I might give it a try!! Oh my goodness. Banana Biscotti! This looks amazing..I am going to try this soon. I will be sure to add you to my blogroll as a reminder! I bet these would be delicious dipped in chocolate! Thanks so much for posting this recipe! Ooh YUM! Thank you, they look amazing!!! Thank you so much anonymous! Measurement corrected - good spotting.